Incensed residents halted an input session hosted by developers to demand an extended community engagement process. 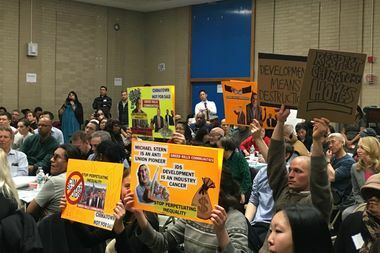 LOWER EAST SIDE — A meeting aimed at gathering feedback for three massive waterfront developments ended in a mass walkout by incensed locals when developers did not immediately concede to demands from resident leaders for an extended community engagement process. Tenant representatives equipped with a megaphone halted an input session hosted by developers in the auditorium of P.S. 184 Wednesday night — one of four meetings aimed at gathering community feedback to help assess the impact of the three towers. The reps took turns reading aloud a letter demanding more time to provide feedback, stating the current cramped timeline doesn't allow for meaningful input from concerned locals. "We are writing you to express our concerns about the relative short period being afforded to our community in order to be informed and provide meaningful feedback about the three massive developments planned within a two block area in our back yard," said Marc Richardson of the Lands End I tenant association, a member of the task force that was created to help inform the review process, eliciting applause from the crowd of residents. The letter, which has been published online to gather petition signatures, demands the developers — JDS Development Group, Starrett Development and Two Bridges Associates — and the Department of City Planning extend the deadline for the projects' scoping meeting. The current deadline is April, but resident leaders want to push that back to at least September, drawing out the period allotted for gathering community feedback before the city-mandated environmental review process. The representatives, many of whom are members of the task force created to help inform the review process, said they have made their demands known to city reps and developers in the past but had not received a straightforward answer. They also demanded elected officials organize more town halls and meetings for gathering feedback during the process. After reading the letter, the representatives called for community members who agreed with their demands to stand. Residents rose to their feet, waving signs, chanting "Developers and DCP, push back the timeline!" Borough President Gale Brewer said she had also requested the timeline be pushed back, but her request had been declined by developers. An attorney representing all three developers in the environmental review process said he did not believe it would be beneficial to delay the public scoping meeting scheduled for April, where the city will hear input on the scope of the environmental review, because it would delay an opportunity for locals to have a formal say in the process. "We don't think that is the right way to approach it," said lawyer David Karnovsky. "We think that process should start because that's where you get insight into how City Planning is going to look at this process." Nonetheless, Karnovsky pledged a response to the community members' demands within a week. But the developers themselves chose to remain silent, declining to address the demands at Wednesday's meeting, angering residents who feel snubbed by the process. "We need to be more vocal, and we need to protest more, and we need to get out in our community and get more people involved, because they're not taking us seriously," said one resident. "Whatever our requests are, they don't even come up and answer, they won't even engage us, because we're not worth it." When reached after the meeting, representatives for all three developers declined to comment on the demands. When a community member called for those who still wanted to carry on with the meeting — which had been set aside for locals to gather in "breakout" groups to lay out topics of importance in the environmental review process — to stand, only a few in the crowd stood up. A mass of enraged community members then filed out of the meeting, though dozens opted to stay and participate in the input session. Richardson clarified that resident leaders spearheading the demands did not organize the walkout and planned to continue engaging with developers and city representatives throughout the process. The Department of City Planning did not immediately return a request for comment.